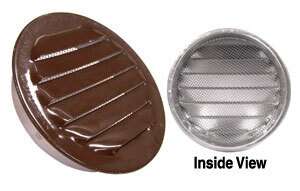 These round louver and screen vents are made of .020-gauge aluminum. This thick, durable material maximizes lifespan and ensures proper ventilation needs. Suitable for installation in wood, plastic or metal. Come standard with insect screen.